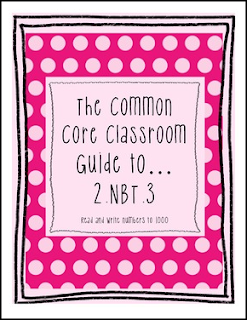 This packet is an easy way to get started with the math common core state standard 2.NBT.3. It will help you make informed decisions on how to teach the place value concept of reading and writing numbers to 1000 using base-ten notation, number names, and expanded form. Classroom activities and student learning targets are suggested. A short assessment is included and can easily be used as a pre-assessment as well as a post-assessment. There are also prompts in varying formats that are easy to use as journal prompts or exit slips. 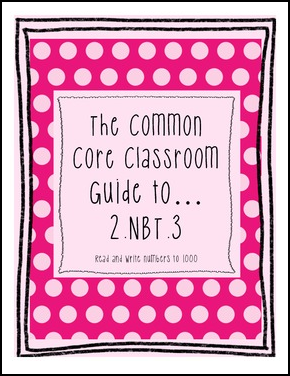 IF YOU LIKE THIS GUIDE PLEASE TAKE TIME TO CHECK OUT OUR OTHER GUIDES TO HELP YOU BETTER UNDERSTAND THE COMMON CORE! ***We also have some great games that will help students practice this standard.